Our guest room got a little bit of freshening up! Let's take a look at this lovely space once again as the sunshine beams in. Do you know what we changed up? The bedding! I am really excited to show it off! To take a look back at the evolution of this room, here it is before we removed the carpet and painted the walls. Here it is after Alex refinished the wood floors and painted the walls with Behr's Cumberland Fog. It was better, but still just a little bland. Then we got SUPER LUCKY when Kevin and Layla Palmer from the Lettered Cottage came and went junkin' with us and redid our room! It was awesome! Layla used the existing bedding we already had at the time and it looked totally perfect! After a few months I had an itch to change the bedding to something that was just white and textured. What do you think? Still like the look? I left everything else the same way Layla had decorated it in September because, I still love it as is and we always get compliments on the room when we have guests over. Here is a closer look at the new bedding. The duvet has a rouched texture and if you are curious it is the Home brand from Target. The quilt is the same Shabby Chic Quilt I had in September. Still in love with it! I loved all the different textures on the patches of the quilt. The pillow is a bolster from Ikea. Here are the pillow shams that match the duvet and quilt. Just dreamy! Oh, I did make one other change. I replaced the framed photo with this canvas painting I made that says 'Sweet Dreams' in French. So what are we still missing in here? Window treatments, ugh, I need window treatments everywhere I think and it isn't my strong suit picking them out. When Layla and Kevin redid the room they wanted to pick out window treatments for us, but we didn't have enough time that day. All we have in there are these ugly plastic blinds. Ick! 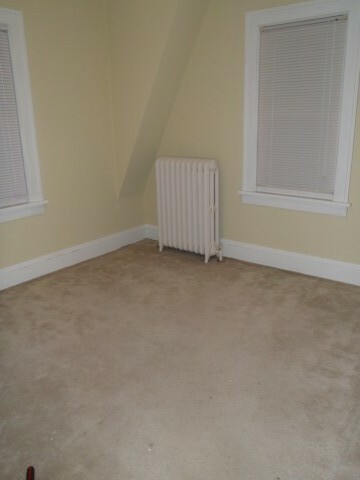 So, I'd love to hear any suggestions for what kind of window treatments we should get! There is one challenge though. Since this room is so small the bed only fits in there when it is butted up against the window. So, long drapey curtains won't work. All I can think of is bubble or tie up shades. I would love any other ideas or suggestions! Please sound off in the comments! Thank you, thank you! Have a good weekend! PS- Since I was out of town most of this week I will not be doing a Head Over Heels post. I wanted to catch up on some house posts so stay tuned for next weeks, it will be awesome! Even My Chalkboards Wish They Were Irish Today!